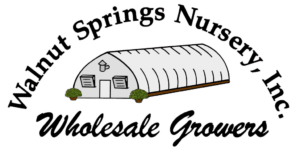 ﻿ About Us | Walnut Springs Nursery, Inc.
Walnut Springs Nursery is a family owned and operated grower of annuals dedicated to serving the greater Baltimore, Washington D.C., and Northern Virginia areas. Throughout over five decades of organizational growth and development, we have remained committed to our core values: exceptional quality and superior customer service. At Walnut Springs, quality means growing a beautiful, healthy product we’d be proud to have in our own homes, gardens, and beds. Our products are grown with precision and care from start to finish by our professional staff, many of whom have received extensive formal training in horticulture. This is backed by a constant process of evaluation and quality control, in order to ensure that the product lines offered here are the best choices for our region and our customers. Our commitment goes beyond the finished product that we deliver. We believe that exceptional quality must be backed by superior customer service, and that a strong relationship with each of our customers is vital to our success. A commitment to smart organizational growth has allowed us to combine the flexibility and fast turn-around times of a small greenhouse grower with the diverse product offerings and robust production capabilities of a typical wholesale grower. Growing a quality product is essential, but we recognize that in an industry where things change quickly, versatility support, and expertise can be just as vital. J. Alvin Smith began sowing the seeds to success early in his life. Al grew up on the Gude Farm in Laurel, Maryland. He was inspired by his father Robert Henry Smith “Smitty” and the Gude Family to become a professional horticulturalist. At the age of ten, he began experimenting with growing techniques and producing flowers for the Washington D.C. retail markets. After his first sale, he set life-long goals of owning and operating the largest and best quality nursery on the east coast. While in high school, Al excelled in the sciences and worked part-time with the Department of Agriculture. He trained under Dr. Neil Stewart in research and development of new fertilizers and pesticides. After fulfilling his duty in the Army, Al continued working for the Department of Agriculture and later applied his talents at the W.R. Grace Company. In 1964 he founded Walnut Springs Nursery, Inc. The name was chosen for the many walnut trees and fresh springs on the Mckendree Road location. Early in the business development, it was decided to remain a “wholesale only” nursery. At first, Walnut Springs sold azaleas, woody ornamentals and rhodendrons for local garden centers. They eventually joined in on the foliage craze of the 70’s growing foliage and poinsettias for the mass markets. It wasn’t until the early 80’s that growing springtime annuals in 4.5”pots & 10”hanging baskets became the main focus. In the early 90’s, fall pansies were added to the program providing fulltime color throughout the fall and early spring. Rooted in quality and service, Walnut Springs’ future would be devoted to the independent garden centers and landscape contractors. Inspired by his hard work and dedication, his children Burke, Cortland, September and his nephew David became involved in the business fulltime in the early 90’s. In 1999, Walnut Springs was recognized as an “up and coming” greenhouse operation in the industry and was rated one of the Top 100 Growers in America by Growers Talk magazine. The following year, we were recognized by the Maryland Greenhouse Grower Association as the “Greenhouse Grower of the Year” for 2000. 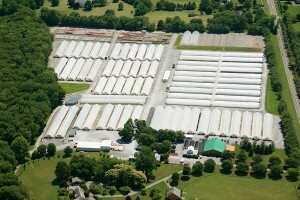 To better serve our customers, Walnut Springs Nursery, Inc. decided to consolidate its two locations in 2003. By 2004, we had officially moved headquarters to our current Burntwoods Road location. The Walnut Springs’ family continues to find innovative ways to grow, sell and deliver plants. Over the last ten years, they have worked on increasing the efficiency and production capabilities of a single location. During this period of significant change and development, we’ve fearlessly embraced new technologies to increase efficiency while allowing us to be even more responsive to customer needs. Our decision to utilize the ARGUS environmental control management system has allowed us to refine and perfect our greenhouse growing techniques. Equally notable is the addition of the SBI business management software, which has taken our abilities to manage inventory, streamline business tasks, and improve customer communication to a new level. We’re proud of our ability to continually adapt to a changing idustry, even though this can lead to some tough decisions. One such decision came in 2008, when we decided–with a heavy heart–to stop growing Poinsettias after 40 years of production. Our ability to adapt was tested again in 2012 by the emergence of impatiens downy mildew in the Baltimore/Washington D.C. metropolitan areas. This devastating disease affects impatiens wallerina and currently has no known cure. Like many others in our industry, we had a tough decision to make about the future of impatiens. After deciding that the risks to our business and environment outweighed the benefits, we ceased production of this home and garden staple in 2013. With each challenge comes an opportunity, and we have expanded our offerings to give our customers more choices and greater quantity than ever before. These expanded offerings include many other types of impatiens that are not susceptible to the disease. In 2014, we celebrated our 50th anniversary. Running a family-owned horticultural business has been incredibly rewarding, and nothing is a greater source of pride for us than producing a top quality product for our customers. We always tell our customer, employees, family and friends about how excited and honored we are as a company to provide beautiful flowers in our region to help keep “America in Bloom.” Our future success is ultimately decided by how we serve our customers. We will continue to strive for excellence in horticulture by providing Professional Quality Plants backed with Superior Customer Service!